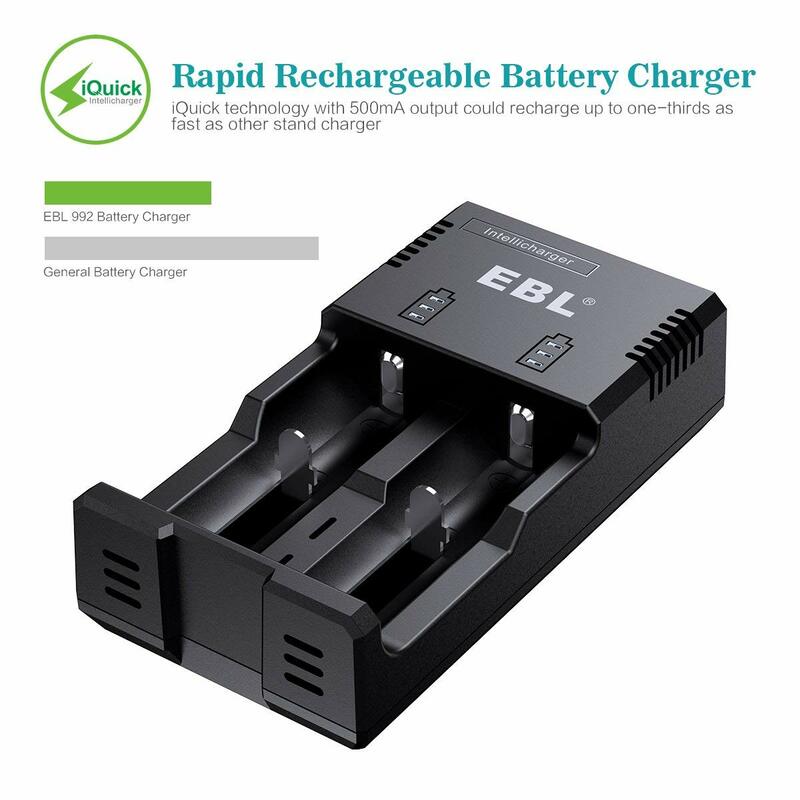 Intelligent charger with iQuick technology and upgraded charging speed, output up to 500mA, gives quick charges to your batteries. 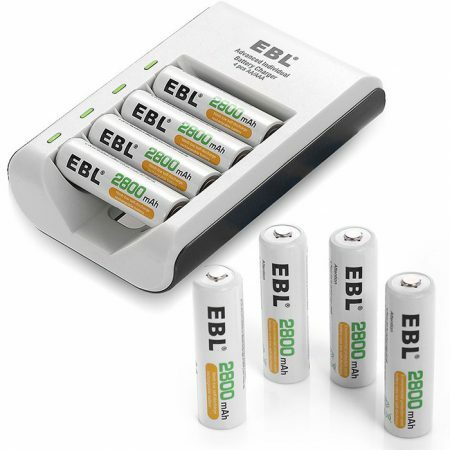 Advanced MCU control technology and overloading protection: it will automatically stop charging when batteries are fully charged. 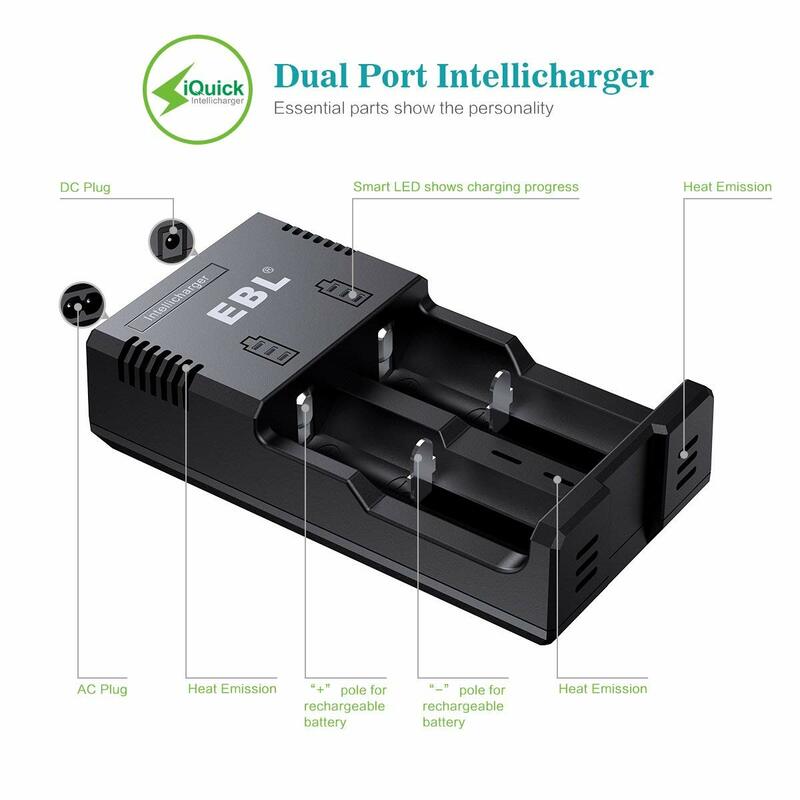 Smart LEDs show charging progress: When a slot’s 3 LEDs are on, it means the battery is fully charged. 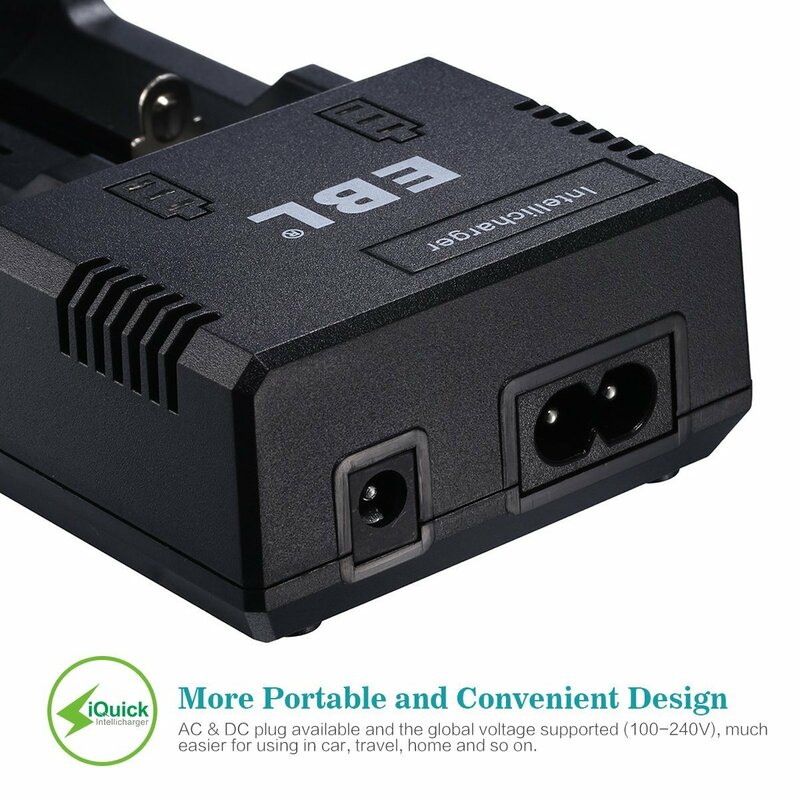 Suitable for universal DC outlets, portable and convenient for traveling. 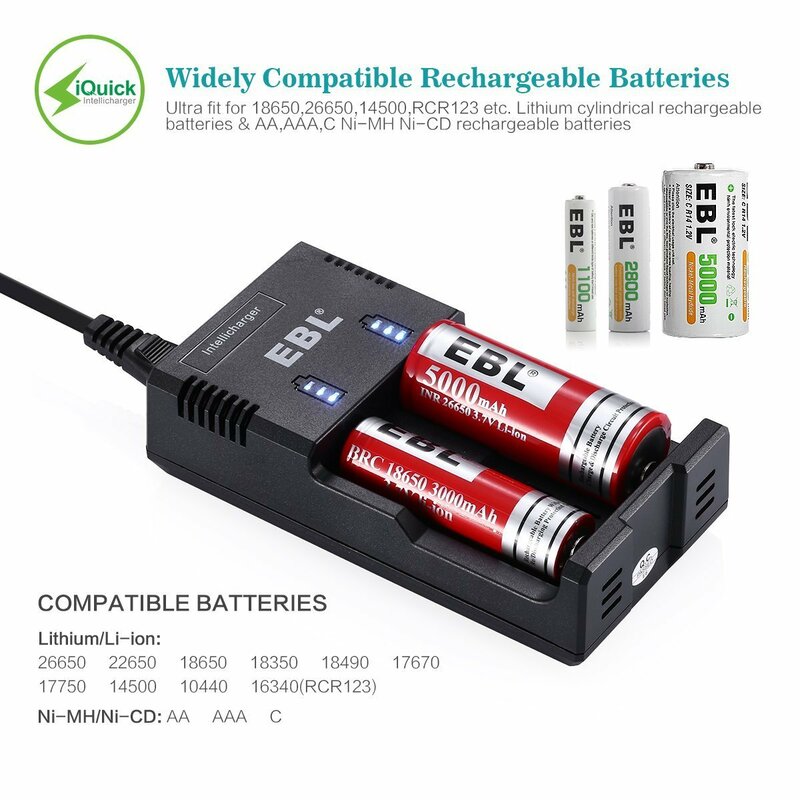 Widely compatible with 18650, 26650, 22650, 17670, 18490, 16340 (RCR123), 14500, 10440 Li-ion cylindrical and AA, AAA, C Ni-MH Ni-CD rechargeable batteries. 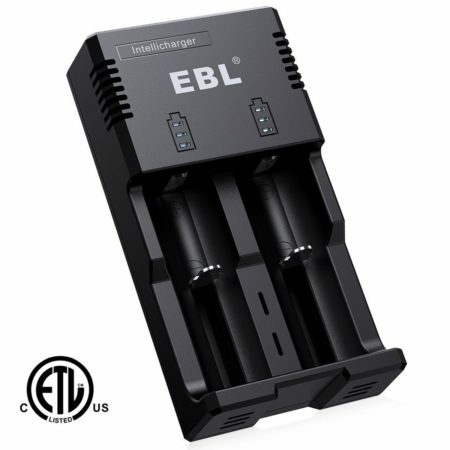 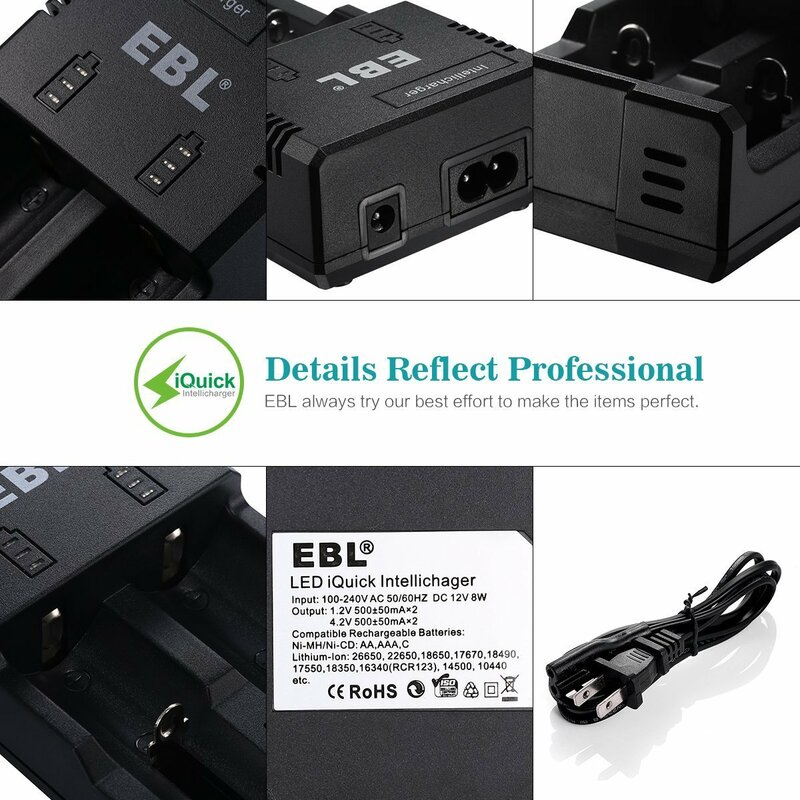 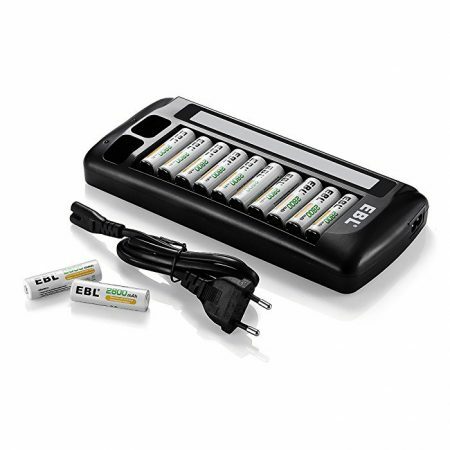 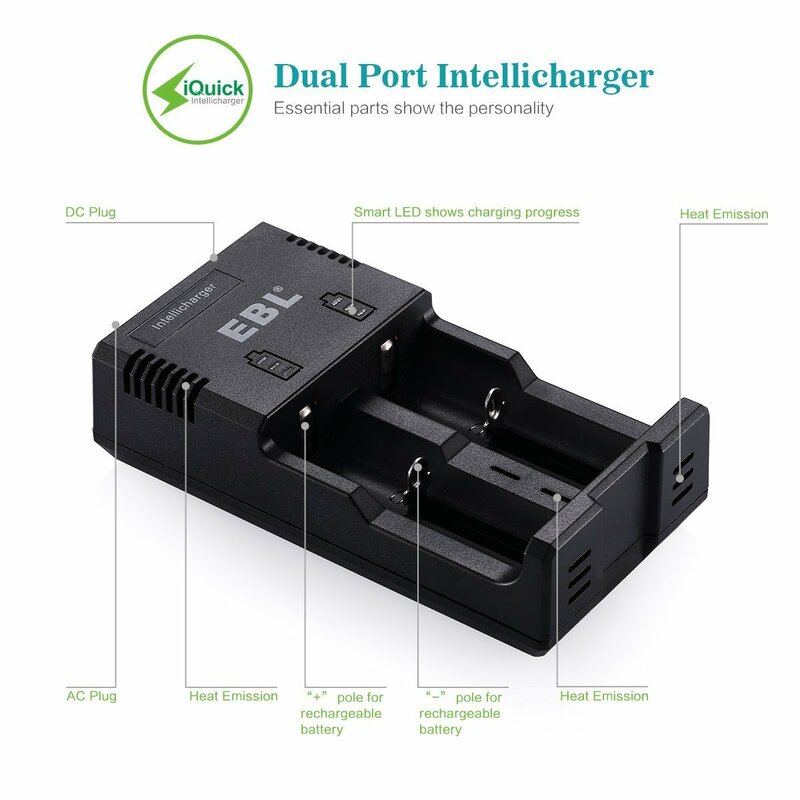 EBL 992 battery charger with independent charging slots for 1 to 2 batteries and the iQuick charging speed, 500mA, can give quick charges for your batteries. This charger can be used in DC outlet, providing great conveniences for recharging your batteries. 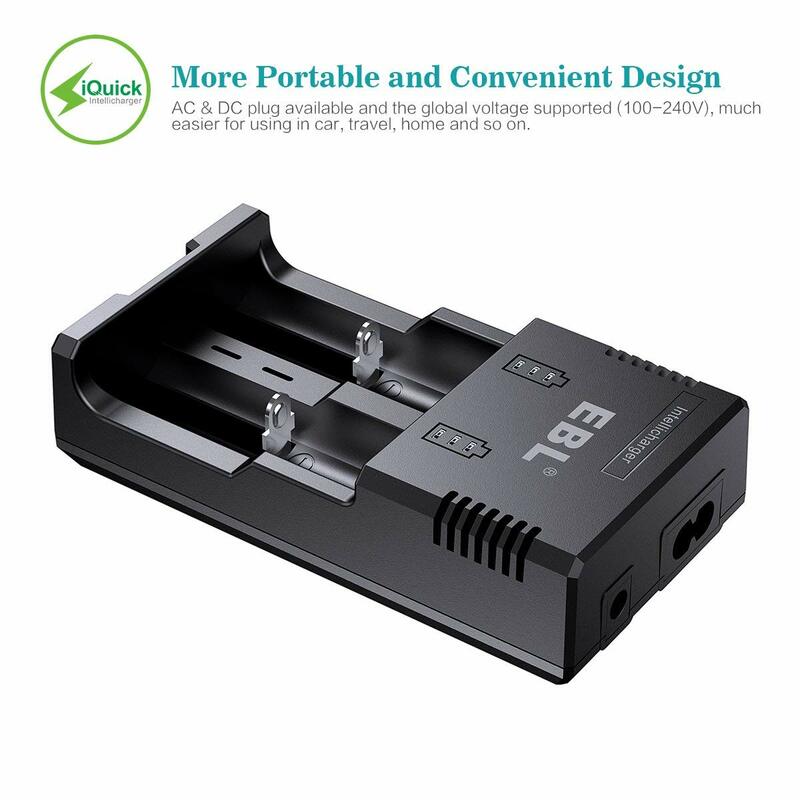 It’s a great smart charger for travel. 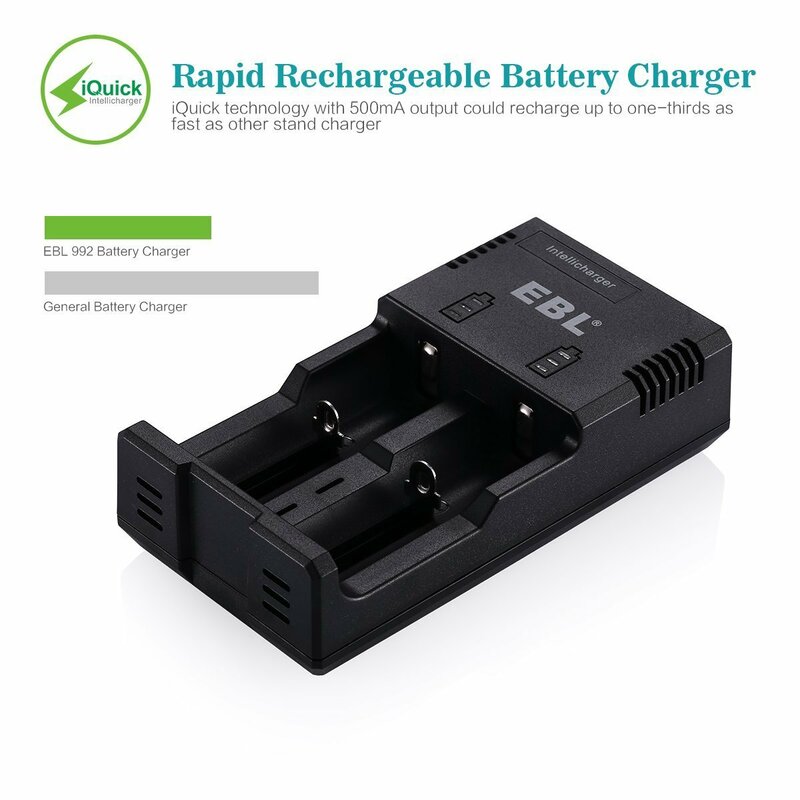 Output current up to 500mA±50mA, compared with ordinary battery chargers, it requires only half the time to charge the batteries fully. 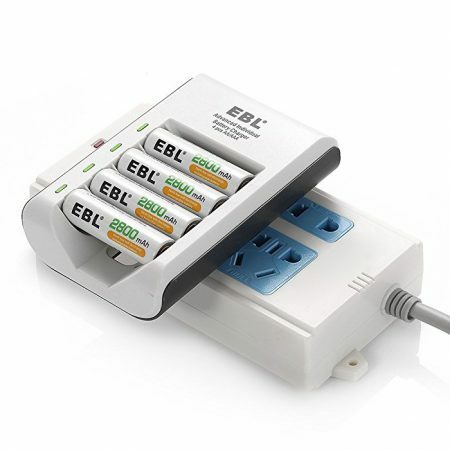 * Constant current and voltage with auto detection for over heating and smart protection against over charging. 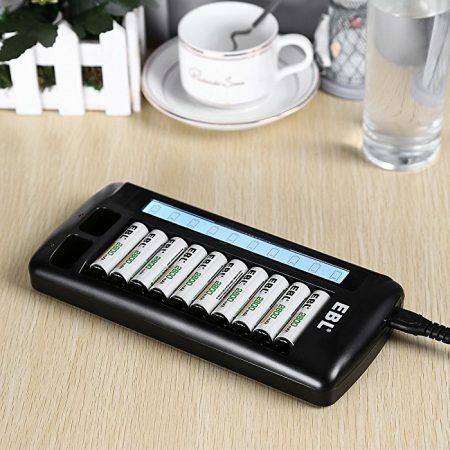 * MCU control technology with △V pulse charging: it automatically stops charging when batteries are charged fully.